it is supposed to be cold here this weekend. really cold. like highs in the teens (-7 to – 11 C.) and nighttime temperatures even colder. fortunately, i don’t have to go anywhere tomorrow, and i’m a knitter. which means i have nice warm wool socks. namely, nice warm just off the needles – finally – rococo. this would be the pair where sock 1 was finished in august, sock 2 was ignored until finally i cast on in the late fall and my gauge was completely different, so it got set aside again. but i ordered smaller needles, cast on over the holidays and, after a glove-induced delay finally have a finished pair! it seems to show the pattern better. however, as the days get longer – and eventually they might even get warmer(!) we’ll have better photo weather again. i did enjoy knitting these – despite the big gap. 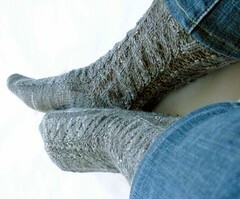 they were my first toe-up socks and i think i’m a convert – they fit the best of any socks i’ve made for myself. it seems like it’s easier for me to decide to start the heel at the right spot (toe-up) than the toe at the right spot (cuff down). now…which of my remaining unfinished projects to work on next…? oh they are gorgeous!! i love ’em . . . The socks look wonderful! Well done you on getting wips finished.